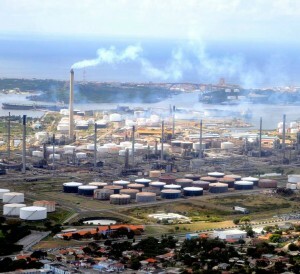 WILLEMSTAD - The Isla refinery is, in its own words, not responsible for the inconvenience that was caused by the smoke yesterday morning. This nuisance ensured that several schools in that area had to send their students home. The oil refinery emitted a press release on this issue. The schools were evacuated because of a pungent odor; students and teachers complain of headaches and burning eyes. According to the Isla, the problem as caused by the power plant on the refinery site which does not fall under the responsibility of the refinery. Smoke came out of the chimney of the power plant and because of the weather conditions it did not dissolve but stayed in the area where the schools are located. There are also several houses in that area and those people were not evacuated. The Minister of Public Health, Environment, and Nature Zita Jesus-Leito and Prime Minister Hensley Koeiman who is temporarily in charge of education visited the affected schools.